Banshee Screamer Alarm is a snoozeable alarm clock designed to wake you up. 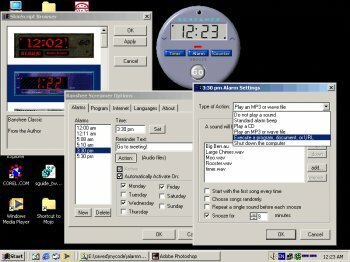 Play MP3s, execute programs, or shut down your computer at the time you set. Schedule up to 99 alarms on different days of the week. Automatically synchronize your time with the Internet. Fully skinnable; import over 500 skins from other clock programs. Multilingual.